Map of Kazuń Nowy, Poland. 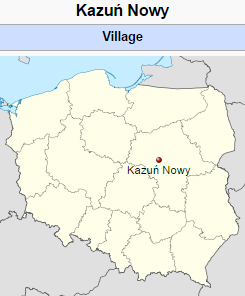 Deutsch-Kazun (now known as Kazuń Nowy; coordinates: 52.419167, 20.684167 [52° 25′ 9″ N, 20° 41′ 3″ E]; population in 2008, approximately 500) is located 2.7 km (1.7 miles) south-west of Nowy Dwór Mazowiecki, 16.6 km (10.3 miles) west north-west of Łomianki, 17.1 km (10.6 miles) west of Legionowo, and 24.8 km (15.4 miles) north of Błonie. It was situated near Modlin below Warsaw on the left bank of the Vistula River. In 2014 it was a village in the administrative district of Gmina Czosnów, within Nowy Dwór Mazowiecki County, Masovian Voivodeship, in east-central Poland. Deutsch-Kazun was founded in 1776. Judging from the family names, the congregation seems to have been formed largely by emigrants from the churches at Culm and Graudenz (from Gruppe Ewert, Kopper, Bartel; from Obernessau Janz, Kerber, Balzer, Stobbe; from Grosswerder Kliewer, Schröder, Penner). The old church, built in 1823, was torn down in 1891 because it was threatened by the floods of the Vistula. The new church, dedicated 30 October 1892, was built with all the other buildings of the village behind a protective dam. In the years preceding World War I, the congregation numbered 548 souls, of whom 375 were baptized members. More than half lived in the village of Kazun. In 1940 the baptized membership was 260, with 144 unbaptized children. A church record begun in 1834 indicates that the congregation was once much larger, for in 1846 there were 28 baptismal candidates and in 1851 there were 38. Twenty to 25 were usual. In the 1860s a decline set in. The age of the candidates for baptism varied from 13 to 17. Deutsch-Kazun had 10 subsidiary congregations. All of them suffered in varying degrees from World War I. The church was destroyed in the war and rebuilt in 1924. For a year the entire membership was removed to the Deutsch-Wymysle congregation, 50 miles (80 km) to the south. In 1923 a Mennonite Brethren congregation was organized at Kazun subsidiary to the Mennonite Brethren congregation at Deutsch-Wymysle. The anti-German feeling in Poland after World War I, conditioned in part by Polish national feeling connected with the reconstruction of Poland as a national state, intensified by the rising tide of German nationalism accompanying the Hitler regime in Germany after 1933, plus the deliberate propagandizing by the National-Socialist movement's foreign section, made the situation of German enclaves like Deutsch-Kazun increasingly difficult. Added to this was the fact that most of the members of the congregation lived within the area of the ring of forts surrounding Warsaw, particularly the fortress Modlin. When therefore the German air force bombed Modlin in the early days of the German attack on Poland, September 1939, it was inevitable that the Kazun Mennonites should suffer. Five Mennonite homes were destroyed, and seven members were killed by an air attack 22 September 1939. The Poles, naturally bitter because of the German attack, were brutally harsh toward the Germans in their midst. On 7 September 1939 the elder of the church, Rudolf Bartel (ordained 1912), was shot by Polish soldiers, together with seven other members. All the remaining males of the congregation, 17 to 60 years of age, were interned in the Bereza-Katuska prison near Brest-Litovsk, soon to be released as the result of the German conquest of Poland. The reconquest of Poland by the Russian armies meant the liquidation of the congregation in 1945 by flight in part and by expulsion for those who remained. Wilhelm Schröder and Elder Leonhard Ewert found their way into Germany. The fate of Peter Schröder and Eduard Schröder is unknown. Mennonitischer Gemeinde-Kalender (formerly Christlicher Gemeinde-Kalender). 1941: 89-93. Hege, Christian and Christian Neff. Mennonitisches Lexikon. Frankfurt & Weierhof: Hege; Karlsruhe; Schneider, 1911, 92; 1916, 43, 61: I, 419. Marnnhardt, H.G. Jahrbuch der Mennoniten-Gemeinden in West- und Ostpreussen. Danzig : H.G. Mannhardt, 1883: 102. Stowarzyszenie Konserwatorów Zabytków. "Nowy Kazuń." Catalogue of Monuments of Dutch Colonization in Poland. 2005. Web. 8 September 2014. http://www.holland.org.pl/art.php?kat=obiekt&id=122&lang=en. Wiebe, Herbert. Das Siedlungswerk niederländischer Mennoniten im Weichseltal zwischen Fordon und Weissenberg bis zum Ausgang des 18. Jahrhunderts. Marburg a.d. Lahn : Johann Gottfried Herder-Institut, 1952. Wikipedia. "Kazuń Nowy." 21 August 2013. Web. 7 September 2014. https://en.wikipedia.org/wiki/Kazu%C5%84_Nowy. Kerber, W. and Harold S. Bender. "Deutsch-Kazun (Masovian Voivodeship, Poland)." Global Anabaptist Mennonite Encyclopedia Online. September 2014. Web. 20 Apr 2019. http://gameo.org/index.php?title=Deutsch-Kazun_(Masovian_Voivodeship,_Poland)&oldid=124591. Kerber, W. and Harold S. Bender. (September 2014). Deutsch-Kazun (Masovian Voivodeship, Poland). Global Anabaptist Mennonite Encyclopedia Online. Retrieved 20 April 2019, from http://gameo.org/index.php?title=Deutsch-Kazun_(Masovian_Voivodeship,_Poland)&oldid=124591. This page was last modified on 13 September 2014, at 07:53.